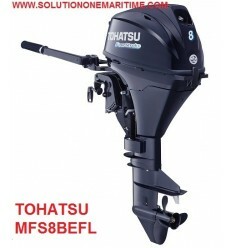 Tohatsu Outboards 8 HP-9.8 HP There are 7 products. Tohatsu Outboards MFS8BS 5 Year Warranty Unmatched in its class, the Tohatsu 9.8 hp 4-stroke has set the standard in portable outboard power! This lightweight motor weighs in at barely over the 80 lb mark and has undeniable characteristics of a true marine champion. Tohatsu Outboards MFS8BL 5 Year Warranty Unmatched in its class, the Tohatsu 9.8 hp 4-stroke has set the standard in portable outboard power! This lightweight motor weighs in at barely over the 80 lb mark and has undeniable characteristics of a true marine champion. Tohatsu Outboards MFS8BEFL 5 Year Warranty Unmatched in its class, the Tohatsu 9.8 hp 4-stroke has set the standard in portable outboard power! This lightweight motor weighs in at barely over the 80 lb mark and has undeniable characteristics of a true marine champion. Tohatsu Outboards MFS9.8BS 5 Year Warranty Unmatched in its class, the Tohatsu 9.8 hp 4-stroke has set the standard in portable outboard power! This lightweight motor weighs in at barely over the 80 lb mark and has undeniable characteristics of a true marine champion. Tohatsu Outboards MFS9.8BL 5 Year Warranty Unmatched in its class, the Tohatsu 9.8 hp 4-stroke has set the standard in portable outboard power! This lightweight motor weighs in at barely over the 81 lb mark and has undeniable characteristics of a true marine champion. Tohatsu Outboards MFS9.8BEFS 5 Year Warranty Unmatched in its class, the Tohatsu 9.8 hp 4-stroke has set the standard in portable outboard power! This lightweight motor weighs in at barely over the 80 lb mark and has undeniable characteristics of a true marine champion. Tohatsu Outboards MFS9.8BEFL 5 Year Warranty Unmatched in its class, the Tohatsu 9.8 hp 4-stroke has set the standard in portable outboard power! This lightweight motor weighs in at barely over the 81 lb mark and has undeniable characteristics of a true marine champion.